Base Model Pet Door 199-211cm: from $239 including delivery*! Our Screwless PatiolockTM dog doors for sliding doors are truly DIFFERENT to ALL other temporary pet doors! Our PatioLockTM Pet Door Insert (Patent Pending) is the ONLY dog door for sliding doors that can LOCK the glass sliding door with No Screwing, No drilling and No cutting! How? Our PatiolockTM dog door for sliding doors is the ONLY pet door that has its own set of adjustable security locks that locks the pet door insert into your existing sliding door locks. Smarter. Simpler. Effective. Convenient. This patent pending screwless and smarter security system means you can now lock your glass door to the sliding door dog door without having to screw anything or transfer lock mechanisms or cut or drill or dismantle lock parts or install patio bolts or screw brackets or use crude rod contraptions like all the other pet door inserts on the market! Being able to lock the sliding door dog door instantly without screwing, cutting or drilling is a true game changer for both renters and home owners. With our PatioLockTM pet door insert you can simply keep using and locking your sliding door normally as it was designed. Ultimately, why screw holes and buy/fit extra brackets etc to try and secure a doggie door for sliding doors when you don't need to? Your sliding door already has its own set of locks that can be utilised effectively. Please note handy skills or tools are NOT required to fit our PatiolockTM dog doors for sliding doors so everyone can now access and enjoy the Ultimate in Security and Convenience. That's not all...we also have the ONLY Patented Adjustable Screen Door Adapter! When fitting a doggie door for sliding doors most customers want to be able to keep using the screen door to let fresh air into the house without letting all the insects in and to also save money on heating/cooling. Our patented Height Adjustable Screen Door Adapter is the ONLY one in the world that does not require cutting AND can be re-used if/when you move! If you buy the adjustable screen door adapter accessory with your PatiolockTM sliding door dog door then you can keep using your fly / security screen together with the sliding glass door with NO cutting and NO handy skills! Consumer Problems with Hard Ware and Pet Shop models: These brands are not only made from a cheap design perspective to allow retailers 100-160% mark up but they have many other unnecessary disadvantages including: you can not lock the glass door; you can not use your screen door; they tend to come in silver only; they use a two-piece inferior frame design to save retail packaging space (shorter boxes); limited 12 month warranty; limited flap size options; and tall 'rises' which are difficult for older pets to step over to get out of the flap. If you are on a budget, then check out our base model. It is far superior and similar in price. Consumer Problem 2: Brands that advertise 'lock brackets' and 'security packs' etc will require you to FIRST screw the pet door for sliding doors into the wall frame to stop the pet door insert moving. This is not good for renters nor home owners because it leaves screw holes in the the sliding door frames and the temporary pet door. Consumer Problem 3: The SECOND step to gain some security typically involves removing the catch plate that the sliding glass door locks on to from the wall frame onto either an unsightly bracket that will overhang the dog door for sliding door frame or onto a NON-ADJUSTABLE screen door adapter. The latter will require cutting and screwing to get the height to suit the given sliding door frame. Removing catch plates can damage paint work and/or look unsightly with unpainted wall sections exposed. Consumer Problem 4: Not only is screwing and cutting and drilling involved but handy skills and tools and time are needed to transfer locks (note the going rate is $200 for installation on top of the cost of the insert). A lot of people out there do not have the handy skills or tools or time to do this. Consumer Problem 5: Because all other products/brands require the abovementioned screwing to secure the patio pet door, then it all has to be dismantled and unscrewed to remove it. This not only takes time but again you will also need the tools and handy skills. If/when you move, there will be holes from previous catch plates on the pet door insert parts as well because locks are never in the same spot. So, it can pay to check how other pet door inserts are fixed to the wall before you leave holes everywhere and invest $100s of your hard earned money on a less effective and unnecessary security method. The other non-adjustable screen door adapters on the market are also single use (unless you keep moving to houses with progressively shorter doors). The Solution? Our PatioLockTM dog door for sliding doors has NONE of the problems outlined above. It truly offers you the Ultimate in Security and Convenience. So how does our dog door for sliding doors lock without screwing? Finally, Security with Convenience and a Modern Design. Also, because the PatiolockTM system is fully adjustable you can keep using it if/when you move. Again, without the holes and hassles. Our Patented Adjustable Screen Door Adapter can be added to the pet door to enhance security for the glass door AND also allow use of your fly/security screen door without cutting or handy skills. Locks both single opening and double opening sliding doors (ie., two doors that open away from each other)! No holes left in your sliding door or pet door! Locks are Made In Australia - 18 businesses are involved! Is the Base Model a good option if you are on a budget and/or are not bothered by screwing/cutting/drilling? Our Base Model pet door insert is a great and cheaper dog door for sliding doors option. It is suitable for those who own their own homes and are handy and not bothered by cutting, drilling and screwing to transfer lock mechanisms on to a screen door adapter (to lock the glass and screen/security doors). Our base model pet door for sliding doors is also suitable for those on a tight budget as pets can get expensive. You can order the base model pet door on its own and just cut the rod that is included with every pet door to length to wedge the glass door against the pet door. This way no extra locks/brackets/packs etc needed to crudely but effectively lock the glass door against the pet door. The base model pet door on its own (no screen door adapter) is best suited to laundry door installations whereby the extra benefits of buying a screen door adapter are not as critical. For instance, the convenience of using existing locks transferred onto a screen door adapter is not as important as the laundry door is not often used frequently, weather/bug proofing are not as critical as the laundry door can be closed, seamless joins and hidden gaps are not as important in the laundry compared to the living area which is seen all the time. What do I need to CHECK before ordering a pet door insert? Open your sliding door handle and CHECK if it has ONE or TWO hooks that ROTATE from the handle into a catch plate on the wall/frame. REFER pics below. Locks with hooks/tabs that do not rotate and mechanisms that lock inside the sliding door frame are not compatible. Refer pictures below. Send us pics of your locks and check the FAQ section as you can likely still use our base model with a screen door adapter. STEP 2: CHECK your wall frame is 10cm deep (or Less) as per pic below. This is for both PatiolockTM and Base models. STEP 3. Check your sliding door height falls between 199-211cm. Please note extension kits are available for taller doors (eg., 2.4m; 2.7m) in M & L flap sizes. a. From the inside bottom of the floor track to the LOWEST edge of the top track = 199cm or more. b. From the very inside bottom of the floor track to the very inside TOP of the top track = 211cm or less. Did you know most people overestimate the flap size needed? Make sure you order the correct flap size by measuring the shoulder height of your pet against your leg (it's easier) and their shoulder width and then refer to the table below. Do not use pet weight as a guide. Ideally, your pet’s shoulder height should be at least 1-2cm shorter than the flap height and they also need to easily pass through the flap width. Please note cats tend to use the small flap unless they are bigger than average- in which case select a medium flap. Second: Flap Height: Measure your pet from the ground to the top of their shoulders then refer below. NOTE: The bottom rail on ALL pet door sizes is only 5cm, so easy for ALL pets to walk over, even when they are old! The flap height is from the ground to the top of the flap. *Custom colours no longer available. STEP 6: Do I need the Screen Door Adapter? What if I don't even have a screen door? The Screen Door Adapter is recommended with the PatiolockTM pet door insert for many reasons, even if you don't have a screen door. Why? It creates a channel for the glass door to close in to, like your wall frame, which makes the installation much more secure as the join between the pet door and sliding door can not be accessed with a pry bar. The adapter also conceals the locks (exposed lock parts are a catching/injury hazard) and is better for weather/bug proofing and aesthetics (no gaps, seamless joins). The secondary function of the adapter is that you can also use your screen door, which is very handy and can save money on heating/cooling without letting insects into the house. If you are interested in our Base Model patio pet door and you want it to lock, then you need the screen door adapter to transfer the existing sliding door lock mechanisms on to. You can't do this without the screen door adapter as the catch plate needs to be offset past the pet door frame. This is the old method of transferring existing locks which involves the screwing, handy skills, tools, etc and is fine for people who are not fussed about leaving holes and also have access to someone handy with tools. When is it a good idea NOT to buy a Screen Door Adapter? 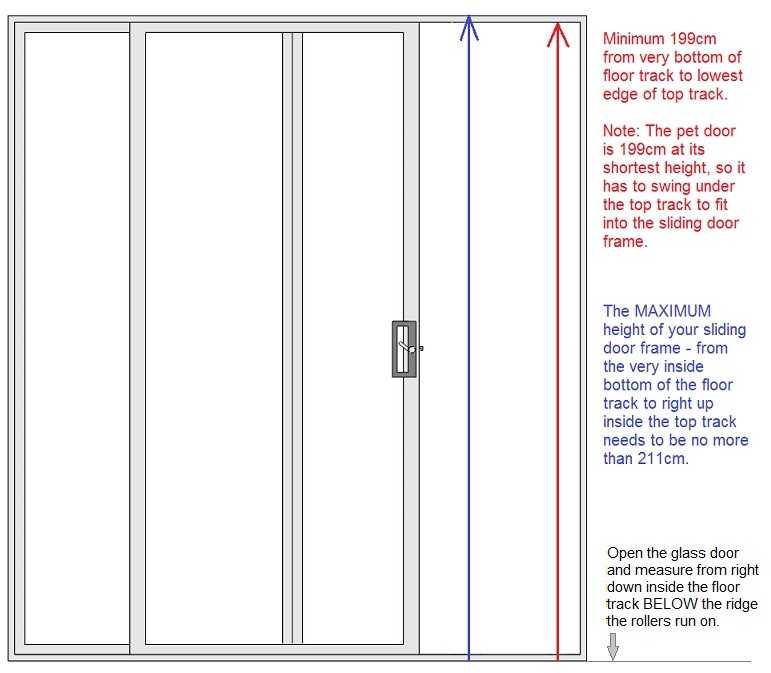 If your sliding door frame has been put in backwards whereby the glass door is in the outside track, the PatiolockTM model can still lock the glass door but only WITHOUT a Screen Door Adapter. If your doors are backwards and you want to seal both your glass and screen door then the base model pet door with the screen door adapter is required but the existing catch plates need to be transferred into the adapter using handy skill/screwing. So, to clarify, you can just use the PatiolockTM model pet door with no screen door adapter and just leave the screen door level with the pet door so the gap for insects to fly through is minimised compared to just leaving the screen door fully open. BUDGET: If you are on a tight budget and/or are putting the pet door for sliding doors in a laundry and security and sealing etc are not important, then you could get away with ordering the pet door insert on its own without a screen door adapter. You then need to come up with a way to lock the glass door (e.g., fit a patio bolt, use a rod in the floor track behind the glass door). STEP 1. 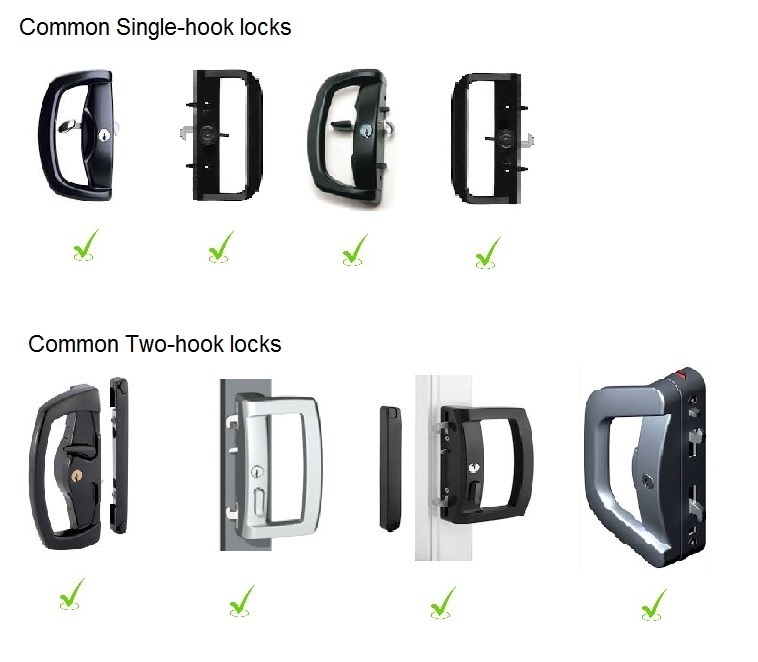 Lock: If buying the PatioLockTM model check if the glass door handle has one or two hooks that ROTATE from the handle. STEP 2. Wall frame: Up to 10cm deep (note: stacker/multiple/timber sliding doors have deeper frames. Contact us before buying). STEP 3. Sliding Door Height: Check the sliding door frame falls between 199-211cm range (Extension kits available for M-L flaps). STEP 4. Flap size. Make sure you follow the guidelines to get the correct size flap. STEP 5: Colour- four colours to chose from: Primrose (cream), Satin Black, White or Silver-grey. STEP 6: Screen Door Adapter- usually recommended for security, functioning, sealing. For exceptions refer above details in Step 6. This product is amazing! Easy to install, fits perfectly and locks securely!! Even matches perfectly with the sliding door. Worth every cent!! Ordered one day...delivered the next. The pre sale service was fantastic to ensure I purchased the right product to fit the existing door lock and my two cavaliers love ❤️ it. Thank you. Very happy with product. Very adjustable so it fits perfectly. Good quality and fast delivery. Great service and product. I'm confused...what model dog door for sliding doors should I buy? The patent pending PatioLockTM dog door for sliding doors with the Adjustable Screen Door Adapter is the Ultimate in Security and Convenience because it offers numerous benefits compared with all other temporary pet doors. As noted, it is the ONLY pet door insert that can lock without screwing but there are also lots of other benefits including: it is cheaper overall as there are no additional handyman costs; it can be reused if/when you move; it has been designed to be installed by people who are NOT handy :); the system is fast and easy to install and remove as no screwing or lock/frame parts to dismantle; you won't leave screw holes everywhere; no extra lock contraptions to buy/fit; and it is the only pet door system that can effectively lock double sliding doors (doors that open away from each other). So great for renters and/or people who are not handy but want security! If you are a home owner AND also have handy skills AND also have 2-3 hours to spare AND are not moving home AND are happy to leave holes in the pet door and sliding door frame, then you could buy the Base Model Pet door with a Screen Door Adapter and transfer locks onto the pet door system. This involves skills, tools, screwing etc. This base model system still works well if screwing and cutting and drilling does not bother you. We understand pets can get expensive, so if you are on a tight budget then the Base Model Pet Door Insert on its own without a screen door adapter is still an effective temporary pet door solution. There is a rod in the patio pet door box that can be cut and put in the floor track to crudely but effectively wedge the glass door against the pet door. You could also add a screen door adapter later if you wanted to transfer locks and/or use your screen door. What if my doors are taller than 2.11m? We have extension kits for Medium and Large flap sizes. One kit will be suitable for sliding doors up to 2.4m. Two kits would be required for sliding doors up to 2.7m. Each kit is $60 if ordered at the same time as the pet door. Kits that are ordered separately will entail shipping and warehouse fees (usually $25) and we will email you for this once the extension kit order is in the system. Please note handy skills and a drill-driver are required to fit the kits. To ORDER an extension kit: Click on the ‘shop’ tab, then ‘pet door options’, then click on the extension kit item. If you have a small flap it is possible to buy a medium extension kit and cut back the panels to the small width using an angle grinder with a 1mm thick blade. If you need to extend an XL flap size, it is possible to use two kits side-by-side and then cut them back to the desired width with an angle grinder. Alternatively, a local sheet metal worker could cut two pieces of aluminium or steel sheet metal (e.g., 1.2mm thick) to the size needed and then rivet this on to the existing top panel at the top of the pet door. Please email for further info on this approach. Are handy skills needed to install the PatioLockTM sets? No handy skills are required. However, a rubber mallet ($3 from hard wares) is helpful to fit the Screen Door Adapter Accessory (recommended). Do I still need to buy a Screen Door Adapter even if I do not have a screen door? 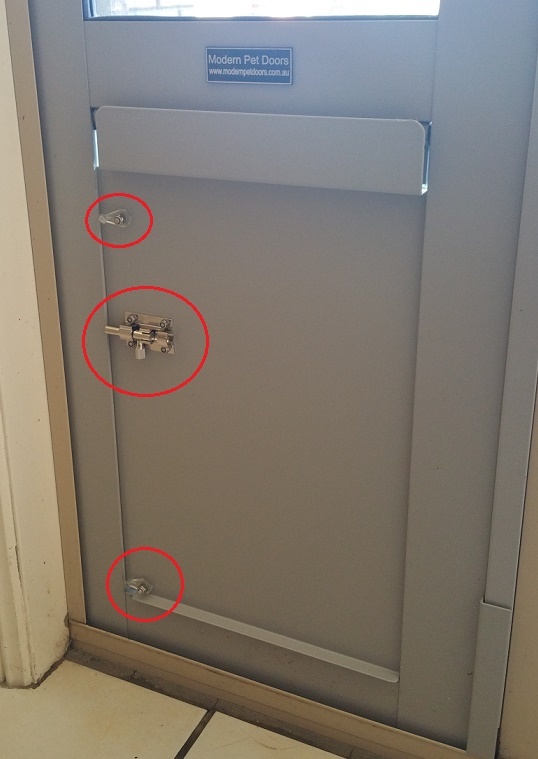 It is recommended if you buy the PatioLockTM model (provided your glass door is on the inside track closest to inside the house) because the adapter hides the locks and creates a more secure installation. There are numerous additional benefits including: better security (reduces prying), great for weather sealing; great for bug proofing; and it looks much better because potential gaps from the join between the pet door and the sliding door are hidden. Does it matter what direction my sliding door opens? No, the systems are universal so they work with both left and right opening doors. What if I have twin-double doors that meet in the middle and open away from each other? Yes, there are options for double sliding doors outlined below. 1. The ONLY pet door for sliding doors that can lock twin doors effectively is the PatiolockTM model. Most customers offset the PatiolockTM pet door insert into the right glass door opening space (standing inside the house looking out). The screen door adapter is then fitted up the left side of the patio pet door so that the left glass and left screen door both close into the adapter. This allows full opening of the left doors for human traffic and it is also the left door that tends to have the handle with the hooks in it. So then the left glass door just locks to the pet door insert normally with the lock in the door handle. The right side of the pet door then locks on to the right glass door. The right screen door is left open to allow the flap to swing in and out of the house. 2. Why can’t the base model pet door with a screen door adapter be used on double doors? Because there is no wall frame to screw/fix the pet door to, so the pet door will just slide under force. 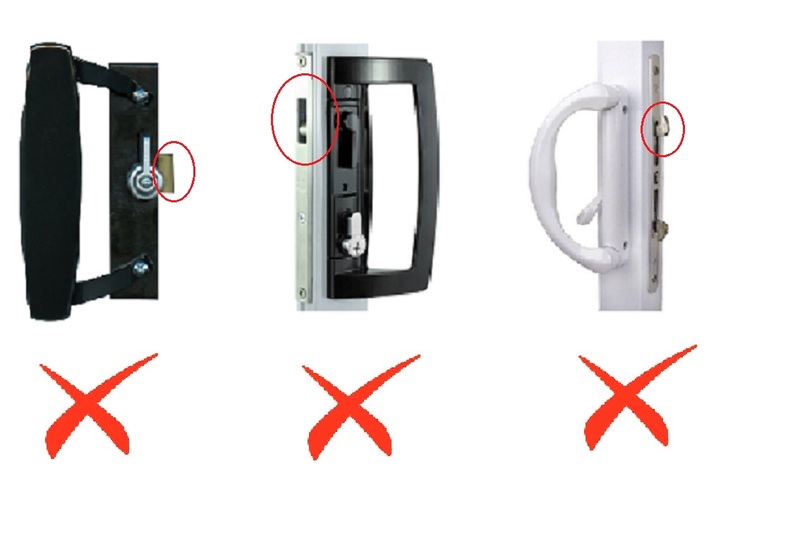 It is also not viable to remove one of the door handles to mount onto the adapter because they are usually too thick/big and then you don’t have a handle on the right glass door, which means the right glass door is not lockable and can be opened for intruder access. 3. If you are on a tight budget then a base model pet door could be used but this would then require fitting patio bolts to both sliding doors (about $20 each from hard wares) to pin the sliding doors against the pet door. This involves screwing & drilling and handy skills etc to fit and thus is a problem for many including renters. These extra costs, especially if you need to pay someone, usually add up to more than just buying the PatioLockTM model in the first place. 4. 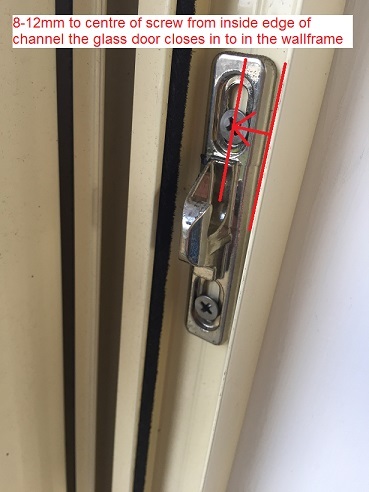 If you have security screens fitted and you buy a screen door adapter, then it is often possible to remove the hook lock from the right security screen door and transfer this into a screen door adapter (screwing required for this step). 5. If you have double-glazed or sound proof thick commercial type frames, then please check the glass sliding door frame that the handle is screwed on to is approximately 3cm or less thick (ie., internal timber doors are approx. 4cm thick). If your frames are thicker than 30mm, then please send through pictures of your locks and frames (ideally with a ruler in the pictures) and we can take a look and let you know options for locking and functioning. The screen door adapter won’t work if the glass door frames are thicker than approximately 32mm. How do I lock my glass sliding door that has internal type locks? 2. If screwing etc is not an option due to the 8-12mm guide not being met, then a rod cut to length and placed in the floor track behind the sliding glass door can be used to lock/wedge the sliding door into the pet door OR fitting a patio bolt ($20 from hard wares but screwing involved) can pin the glass door against the pet door. Will the pet door for sliding door work with multiple or stacker sliding glass doors? Stacker doors are usually expensive and so the PatiolockTM model is recommended to avoid drilling holes in your frames. This is for aluminium sliding door frames that are approximately 3cm or thinner like most common sliding doors (ie the thickness of the aluminium frame that the door handle is screwed on to is 30mm or less in thickness). If your frames are thicker than this, please send us pictures and we can advise you. The only issue with multiple or stacker doors is that they have deeper frames due to the extra sliding panel/s compared to a single sliding door system. The screen door adapter is only 10cm deep as it is made to suit common sliding doors and thus it will not extend out far enough to also capture the screen door (if you have one). If you prefer to use your screen door then some modification to the screen door adapter is needed. A popular approach is to buy a section of rubber or aluminium (e.g., 100x3mm) and stick or rivet it on to the rear of the adapter so that it extends out to touch the screen door. Alternatively, some 1.2mm thick galvanised sheet metal could be cut and folded into an 'L' shape by a local sheet metal company (e.g., 130mm x 15mm x adapter length) and joined to the back of the screen door adapter using rivets/screws. This will create a third channel that can capture the screen door. We suggest powder coating it or spraying it to match the pet door with a spray pack from a paint or hard ware store. Please ensure you understand this mod is required to use your screen door before ordering. My sliding doors are double glazed, will the patio pet door still work? Double-glazed sliding doors with a frame thickness of approximately 30mm or less (ie., the frame the door handle is screwed on to is 3cm thick or less) will typically work. If the frame is thicker than 32mm then the screen door adapter will not work (do not purchase it with the pet door in this case). 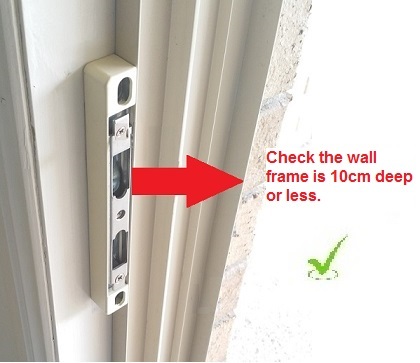 Thicker frames (thicker than 32mm) can also cause a problem for lock alignment with the PatiolockTM pet door for sliding doors. If alignment is an issue due to the extra thickness of your sliding door then you can add a section of 20mm aluminium channel ($3 from hard wares) to the bottom of the temporary pet door frame to bring the pet door closer to the inside of the house so that the locks align. Handy skills adn tools are needed to add the 20mm aluminium channel. If the sliding door frames are thicker than 32mm then you can also get the base model pet door on its own if budget is an issue and use a rod in the floor track or patio bolt to lock the glass door against the pet door. How do locks transfer using the Base Model with a Screen Door Adapter? Hardware to fix the pet door insert into the wall frame is included. We also have pre-drilled holes hidden inside the top panel of the dog door for sliding doors so that it can also be fixed inside the top track for a second fixing point to create a stronger installation. Refer to the picture below to see the grey bracket (for demo purposes) half way up the right side of the temporary pet door. The bracket comes powder coated the same colour as the pet door. The screw up inside the top panel is concealed. Will the dog door for sliding doors work with timber sliding doors? Yes, our doggie doors for sliding doors can still be used in timber sliding doors but there are a few points to be aware of. First, because timber door frames are much thicker than aluminium sliding doors the screen door adapter will not work. So, you would just be buying a pet door insert on its own (no screen door adapter). To lock the door is another factor. The PatiolockTM model can usually lock timber doors but sometimes some mods are needed to shift the locks closer to the edge of the pet door if the door handle on the timber door is more than approximately 13mm back from the leading edge of the timber sliding door frame (ie., more than 13mm back from the edge that closes into the wall). Can the dog door for sliding doors be fitted into the fixed panel of glass behind the sliding door? Some customers have tried to shift the fixed panel across to fit the pet door there instead of in the opening. However, most have not been able to successfully remove all the screws to do this. Moreover, the opening space remains the same regardless of which side the pet door is put so the benefit appears to be negligible compared to fitting the temporary pet door with a screen door adapter. The other limitation with this approach is creating a good seal can be difficult as the screen door adapter can't be used at the back of the door frame. Can the dog door for sliding doors be installed in the screen door track? Not usually because the dog door for sliding door frame is too fat/thick to fit inside the typically narrow channel in the wall frame that screen doors close in to. If you want to use your screen door just purchase the screen door adapter with your pet door insert, that way, you can lock your glass door and use your screen door. If you just put a flap in the screen door you always have to leave the door open to let your pet in/out and this is not only a security risk but it gets very cold in winter! What if my screen door is on the inside track and the glass door is on the outer track? The PatiolockTM dog door for sliding doors can still lock the glass door without screwing (refer lock compatibility section in the checklist steps) but you will not be able to fit the Screen Door Adapter if the glass door is in the outside track. You will need to leave your screen door (if you have one) level with the pet door frame to minimise the gap for insects/air. If you want to use both your glass door and screen door when the doors have been put in backwards (glass door on outside), then the Base Model Pet Door Insert with a Screen Door Adapter can be used but you would need to transfer the locks from the wall frame on to the screen door adapter. This step involves handy skills and tools and screwing. Are gaps common if the dog door for sliding door is fitted without a screen adapter? It is common for sliding door frames to be ‘out of square’ but this is not usually noticed because the glass door slides into a channel in the wall which hides any gaps. The screen door adapter also creates a channel for the glass door to close in to which not only makes it more secure but also hides gaps between the pet door insert frame and the sliding door frame. So, if you bought a pet door without a screen door adapter you can either buy one and add it to the pet door or you can try and shuffle the pet door for sliding doors around to be flush with the sliding glass frame and/or adjust the rollers on the sliding door to change the pitch/angle the sliding door rolls on to close any gaps. For instance, dropping the front wheel of the sliding door will close a gap at the top of the sliding door. A weather seal is included with the pet door to help with small gaps. If you have bigger gaps and are not able to adjust the rollers then an extra strip of seal can be bought from hardwares cheaply (e.g., 12mm square soft foam). How wide are the dog door for sliding door panels? The TOTAL width of the temporary pet doors are outlines below. Can I order my dog door for sliding doors in a custom colour? Sorry, we no longer do custom colours due to high one-off costs. Do pet doors for sliding doors fit tightly inside the wall frame? 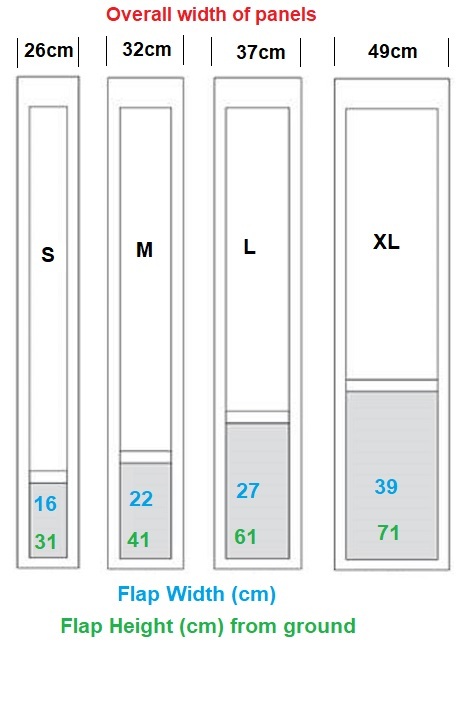 There is a great deal of variation in sliding door frame sizes (12-40+mm). The doggie doors for sliding doors locate themselves over the ridge in the floor track that the rollers for the sliding door run on, so they are able to move some millimetres back and forth. This is normal and is not a structural/functional problem because the pet door inserts are designed to be a stationary product that sits inside the floor track, wall frame and top track, so they can't go anywhere and are not pushed and pulled. We are the only manufacturer to include holes inside the top panel of the pet door which allows an extra fixing point in case you want to firm up the installation. You could also use the bracket provided half way up the pet door but this is not really necessary, as noted, the pet door can not go anywhere. What model sliding door dog door best suits a laundry vs a main living room? The PatioLockTM pet door insert with a screen door adapter is recommended for home owners and/or renters who want to install a pet door for sliding doors into a main living area because it does not involve the screwing and cutting and tools etc and can also be re-used if you move. People who are wanting to put the dog door for sliding doors in a laundry and are not bothered about using the laundry door for human traffic and weather and bug proofing are not an issue then the cheapest solution is our base model pet door without a adapter. You will just need to come up with a way to lock the glass door such as cutting a rod and putting it in the floor track behind the glass door or fit a patio bolt or buy the PatiolockTM model without an adapter (if the door is not to be used for human traffic). Should I buy the PatioLockTM Model or the Base Model pet door insert? The PatioLockTM system is smarter and easier choice for people who want to save time and hassle and do not want to screw holes in their frames nor cut and drill to gain security. The additional cost of the PatiolockTM model compared to our base model is less than half installation charges from a handyman service. One of the additional benefits is that you can re-use the PatioLockTM pet door for sliding doors when you move home as everything is adjustable. It truly does offer the ultimate in security and convenience. However, if you know someone handy and you own your home and screwing holes is not an issue and you have lots of time on your hands (usually 2-3 hours to install the base model), then you would be happy with our base model dog door for sliding doors with a screen door adapter fitted to be able to transfer the existing locks. Why buy your dog door for your sliding door from Modern Pet Doors? 1. Our PatioLockTM system is the only patio pet door to offer SECURITY with CONVENIENCE: No other pet door for sliding doors can lock the sliding door without screwing, cutting, tools or skills for almost instant security without the hassles and installation costs/time of the conventional systems (e.g., our Base Model). Our Adjustable Security Adapter is also the only adjustable adapter (patent pending) so you can install it without tools and also re-use at the next property - great for renters! 2. Quality: We over-engineered our patio pet doors so we can easily offer an Industry Leading 10 year warranty on our doors. We stand behind our product. Note some other brands only offer 1-5 year warranty periods - we wonder about the quality with such limited warranties- do you? 2. Great Value: We offer a Supreme product at truly wholesale pricing that INCLUDES delivery to most major cities/areas (refer shipping section for details). 3. 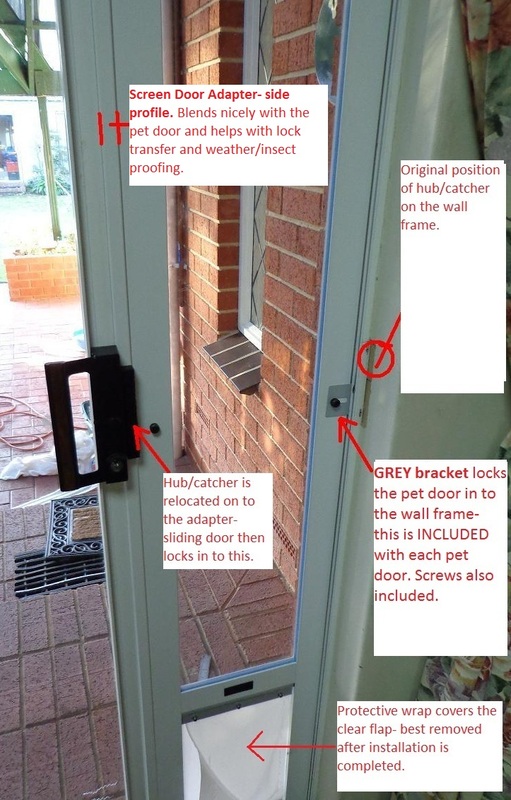 True Security+: The PatioLockTM system with a Screen Door Adapter is class leading and uses existing locks without screwing etc. So, you won't need to buy extra 'security pack' gimmicks and brackets at checkout that are not needed in light of the PatioLock model features. 4. 100% 5 Star Independent Customer Feedback: We have over 1000 'independent' 5/5 Star 100% customer satisfaction reviews on independent sites like EBay (user ID is juru73). Despite other brands claims, this is nearly twice the amount of positive feedback and volume compared to other manufacturers. 5. Two distribution outlets: We are the only manufacturer with more than one distribution outlet to reduce delivery lead times to the entire East and West coast of Australia. 6. Giving Back: Proceeds from every sale go towards supporting a variety of charities including the Guide Dogs for the Blind; Work dogs for kids with Autism and Asberger's; Salvation Army; and Animal Rescue centres. So your purchase is also helping others. - Guide Dogs for the Vision Impaired. We currently sponsor 'Buddy' and 'Olive' in their training program. Our patio pet door will fit your sliding glass door seamlessly. Pets also find it easy to use..check out the clip below! Check our Daisy & friends using their new pet door!